The Sri Lanka Freedom Party (SLFP) yesterday denied claims by the Joint Opposition that SLFP members in the National Unity Government will be attending the inaugural rally of the newly formed Sri Lanka Podujana Peramuna (SLPP) to be held in Nugegoda today. The SLPP was formed in November last year under the leadership of Prof. G. L. Pieris, with the blessings of former President Mahinda Rajapaksa and his allies in the JO. Speaking to the media at the party headquarters on Reid Avenue, Colombo, Ministers Susil Premajayantha and Dilan Perera played down concerns of a possible mass exodus of SLFPers to the Opposition, pointing out that party members are free to meet the party hierarchy, of which Rajapaksa is a prominent member. Both Rajapaksa and his predecessor Chandrika Bandaranaike Kumaratunga currently serve as advisers to the party. Referring to a comment made by the former President requesting SLFP members in the Government not to take part in the rally due to a possible backlash from the powers-that-be, Minister Perera said, tongue in cheek, that if Rajapaksa now claims that there will be a no show from SLFPers at his rally because he asked them not to come, then, by that same logic, President Maithripala Sirisena can say that the Opposition SLFPers at the rally are there upon his request. "No one from the Government was going to attend, as far as we know. Even the SLFP members in the JO going to this rally are doing so with the intention of holding a rally against the UNP. A majority of them are unwilling to undermine the unity of the SLFP," said Perera. No SLFPer in the Government will be at the rally, mainly to ensure the unity of the party, he said, adding that there was a need to move forward as one party with a strategy to win at the upcoming local Government elections. This, he said, was the reason seven SLFP chief ministers recently met Rajapaksa. "They met [Kumaratunga], too," he said, adding that the SLFP also planned to meet former Speaker Chamal Rajapaksa as well. Commenting on the Chief Ministers' meeting with the former President, Minister Premajayantha said that there is nothing wrong with party members meeting a party adviser. He also dismissed the point that today's rally was organised by a different party. "All of those MPs were in the UPFA. They represent the UPFA in Parliament. But they're in the Opposition. As Opposition members, they have a role to play and to point out shortcomings of the Government and to take such issues to the public. That's what they're doing," he said. When asked if it was not wrong of them to take part as members of the SLFP, Premajayantha said this wasn't the first time a rally was held in Nugegoda by the JO. "The first rally was held just two months after the President was elected. The theme of that rally was 'UPFA leaders will address you', but as secretary of the UPFA, I was neither notified of nor invited to this rally. There was a series of such rallies. We did not take part," he said. Minister Perera meanwhile noted that when the Central Committee of the SLFP decided to go for a Unity Government in the wake of the parliamentary elections in August 2015 for a period of two years, SLFP members outside of that Unity Government obtained the President's permission to sit in the Opposition. From Chamal Rajapaksa downwards, he said, there are a large number of SLFP members in the JO that stand up for the unity of the party. Just because there is a rally, these people are not of the position that the party should be split at the upcoming local government polls, he added. "This rally will not get in the way of the party's unity." When asked if they would attend the rally if invited, Minister Premajayantha simply said, "We have not been invited." However, Perera said that there is a great desire to bring SLFPers in both the Government and the Opposition onto a single stage. The Ministers insisted that the SLFP will take key decisions only as a party, together, and a decision will be taken on the party's future course of action at the end of the two years stint in the Unity Government. The SLFP is of the position that the controversial Treasury Bond scam should be investigated at the highest level possible, by way of a presidential commission. 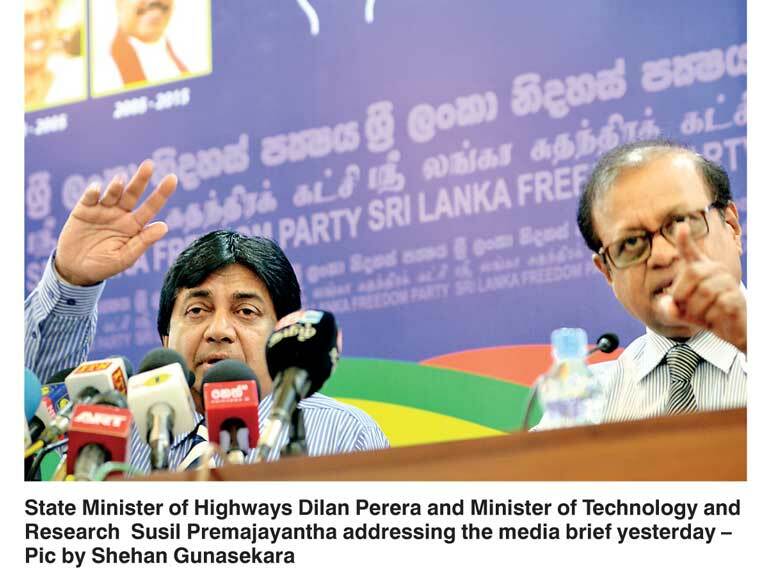 Speaking to the media, Ministers Perera and Premajayantha asserted that the case must not be allowed to be treated as a civil dispute of unjust enrichment, but rather a criminal case where wrongdoings have to be proved beyond reasonable doubt. As COPE findings cannot be used as evidence, there needs to be a fresh investigation by the police, they said.